Launch:Seneca Lake State Park, Geneva, NY. Good ramp and security patrols the parked truck and trailer. 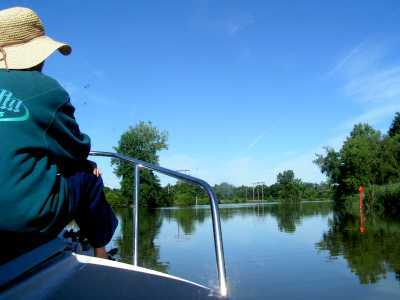 Good access to the Finger Lakes via the Cayuga-Seneca Canal. 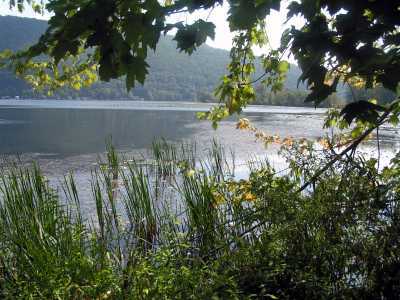 Nearby campsites:Sampson Lake State Park, south on Seneca Lake. It also has a ramp but in 2005 there was a charge for leaving truck and trailer, and no charge at Seneca Lake SP. Comments: These are long lakes, with a few good harbors and plenty of anchoring along lee shores. Good wineries and Watkins Glen at the end of Seneca. What fishing/cruising lakes! --- T This is a region of extraordinary beauty and remarkable geology. Nowhere else in the United States are there eleven long, narrow, parallel lakes -- like the outstretched fingers of two hands imprinted on the landscape. --- T The southern ends of the lakes have high walls, cut by steep gorges. Two of the lakes (Seneca and Cayuga) are among the deepest in North America and have bottoms below sea level. Their unique beauty is the result of the master hand of ice, sculpting the landscape over the past two million years. But, first a trip into the deep past. ---To begin, let's talk about time. Geologists banter time about the way astronomers talk of distance - or politicians talk about money. Let's reduce time to a scale we can more easily understand. The oldest rocks found on Earth are in western Australia. They are 4.1 billion years old. Let's compress those 4.1 billion years into one year, for our scale model, making 4.1 billion years ago January 1st. OK? ---- Our story doesn't begin until mid-November, about 370 million years ago. On our reduced time scale, all of Earth's spring, summer and fall have already passed. Eleven and a half months are already gone! Although it seems we're almost up to date (December 31 at midnight is today), life by mid-November has only begun to take on a familiar appearance. Only a few 'days' ago, the first land plants and first insects evolved. The earliest amphibians and reptiles are still days into the future. Let's go to New York State and see what's happening. ---- -Remember that masterpiece of modern art we have hanging over the mantle -- the geologic map of the state? Well, oout in the west and central part of that map, the colors are a bit boring -- just an orderly band of color stripes. When we were discussing the geology of the Erie Canal , we stated that the top part of this band (the pink, dark green, and light blue) represents mostly soft muddy shale. Mud is easy to dig, either by humans or rivers, so the Erie Canal and many east-west rivers (like the Mohawk) follow the trend of these soft rocks. ---- -Now let's look at the more central green band. Two long north-south digits of the largest Finger Lakes slice the green. The lakes also carve open marvelous exposures of these rocks, and geologists come from all over to "ooh" and "aah". New York boasts of some of the best Devonian exposures anywhere in North America. ---- Such a rhyming name -- Devonian. Early geologists, knocking about the rocks of England, found some interesting rock layers, full of unique fossils, in a far corner of Devon. Hence the name of all rocks of this age (408 to 360 million years ago). --- - In the time just before the Devonian, a warm shallow sea lay basking in the equatorial 'November' sun. The land to the east was just being colonized by plants and animals. The sea, earliest home to life on earth, teemed with fish, trilobites, clams, and corals. Suddenly (geologically speaking), this placid scene was brought to an earth-shattering end. In mid-Devonian, a continent, Avalonia, collided with the east coast of North America. The edge of the continents folded, like the crumpled margins of two carpets shoved together. Lofty mountains thrust upward in New England and the Canadian Maritimes.This story can be read in the geology of the Maine coast. --- -In central New York, a basin downbuckled to the west of the mountain upfold. Erosion gnawed on the eastern highlands, and soon, equatorial rains washed floods of sediments off the uplifted mountains. Huge quantities of detritus --gravel, sand, and mud -- washed down ancient rushing rivers into the Appalachian Basin. The heavy load was dumped into a huge delta -- the Catskill Delta. The weight of this enormous wedge of sediment depressed the crust, and 3,000 feet of mountain-garbage filled the trough. --- -New York was a few degrees south of the equator, and the muddy, warm sea water swarmed with life. The cast-off remains of critters fill the Devonian sediments with a rich fossil assortment -- brachiopods, clams, trilobites, corals, and crinoids. Fossil collectors delight in this Devonian menage and flock to the Finger Lakes area. 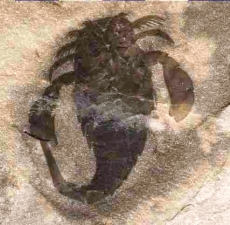 --- -In 1984 the New York State Legislature named one group of these fossils -- the eurypterids -- as the New York State Fossil. The lucky winner is an arthropdod, a crab-like fellow with multiple arms the last two of which were often adapted into paddles for swimming. --- -Then, by late Devonian, it was all gone. Continents continued their slow movement, and sea level dropped. For the first time in 325 million years, our area was dry land. Instead of shimmering sea, it was a great mud flat, tracked by the first amphibians. Erosion continued to gnaw down the now-ancient mountains to the east, and a wedge of alluvium buried the fossil-rich older marine sediments. The Japanese have a saying, "the nail that stands up, gets hammered down." So it is with the land. The destructive fingers of erosion rip away anything standing above sea level. The book of geologic history has whole chapters, hundreds of millions of years, torn out. Oh, here a rock, there a fossil, randomly missed by erosion, but nothing coherent to interpret those long millenia of dinosaur history or the later ascendancy of mammals. --- -There is still a dramatic geologic story to tell. It is said that "every face tells a story," and this is nowhere more true than with the face of the land. Every hill and every lake has a story and nowhere is this more evident than in central New York. --- -Let's get in a time machine, and roll the clock back -- each click will be 10,000 years. You roll back two hundred clicks, to a time two million years ago. Peering out the window, you see a familiar sun shining down onto an unfamiliar landscape. You're still in central New York, but the view is of a worn down, tired old landscape. Where are the familiar hills, chasms, and lakes? You see a land in advanced old-age -- so old that even the wrinkles were worrn away by time. You ponder landscapes -- and decide that erosion is the key. Itts scouring hand carves the material it is given, and shapes it into our perception of natural beauty. The fine hand of erosion sculpts, molds and shapes the land. If you've seen the Grand Canyon, you know the glory from the hand of that sculptor. But, like chocolate chip cookies, too much of a good thing can be bad. Give erosion too free a hand, through too much time, and it sweeps away its own intricate carvings. All is reduced to a flat plain. Here, out your time machine window, you see the result of erosion with too much time on its hand. For two hundred million years it had been working on every hill and filling in every hollow. Got that? TWO HUNDRED MILLION YEARS! Now that's truly advanced old age. --- -On that long-ago afternoon, the warm sun shone down on a worn-down landscape -- there are no hills, no lakes, no nothing -- just a flatland. There are no Finger Lakes -- where they should be, are just rivers meandering lazily northward through wide valleys. And there there are no Great Lakes. Where the Lakes should be, there is a large westward-flowing river carving a broad valley. Your geologic guidebook calls this the Ontarian River. The forests covering the land below look different -- and then you see why -- they are almost all spruce trees, with scattered birch, and they look stunted. --- -You scan the landscape. There is no sign of human activity, since folks haven't walked or paddled to North America yet. You are alone -- and it sends a shiver down your spine. No, that shiver, you decide is from the cold. Soon, you see why. To the northeast, there is a bright shimmer -- ice! As y ou slowly roll those ten thousand-year clicks forward, a towering mass of ice, like those views you see today from Antarctica, oozes toward you. It buries everything. As the 10,000 year clicks scroll, the ice advances -- one mile thick ice grinding over the lland. From horizon to horizon, an Ice Sheet. --- -Today, we know how rapidly climate can change. Those of us who are also in a somewhat advanced state of old age, know the earth is becoming warmer -- quickly. About two hundred clicks ago (two million years), Earth was rapidly becoming colder. That change was probably caused by a wobble in the earth's rotation. --- -While we were shivering in our time machine in central New York, big events were taking place in the Laurentian Highlands, east of Hudson Bay in Labrador. Snow piled so heavily in winter, and temperatures were so reduced, that the snow pile there didn't completely melt in summer. Slowly, the heap of snow grew deeper as more snow fell than melted, year after year. The weight of the accumulating snow converted the deepest part of the pile into ice. And the pile grew and grew, and the underlying ice became thicker and thicker. Eventually, the weight of the snow/ice pile became so great, the mound began to spread outward -- much like piling warm fudge into a mound and watching it delightfully ooze outward in all directions. --- -The more the snow and ice spread, the more the white, year-round, snow surface reflected the heat of the sun back into space (this is called the albedo) and the colder earth became. It became self-perpetuating - more snow, more albedo, colder - therefore more snow, etc. A great ice sheet began to swell across eastern North America. The sheet coalesced with other glacial centers of spreading ice, and soon a continental glacier slowly crunched its way southward (and, by the way, northward). The Ice Age had begun, and still continues (we are fortunate to live in an interglacial period). 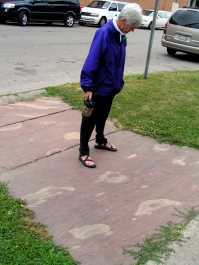 --- -Every summer, the Ontarian River became a torrent, as water melted off the advancing glacier. It scoured its bed into a deep valley. 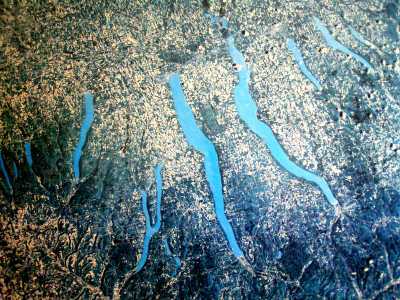 As we watch from above, and the 10,000 years per click continue, the slow southern movement of the ice eventually overwhelms the Ontarian River and enters those parallel north-south river valleys in central New York. Summer meltwater now pours southerly down those valley, slicing them deeply into underlying rock. --- - The ice sheet eventually grinds its way into those north-south river valleys. The ice, more than a mile thick, scoured them ever deeper until some are now hundreds of feet below sea level. If these valleys were along a coast, they would be fjords. --- -As we watch from our time machine in awe, the great ice sheets advance and retreat four times. The last ice sheet reached its maximum extent only two clicks from the present -- just 21,000 years ago. Then Earth begins to warm. The ice sheet finally withdraws from New York just in the last click (11,000 years ago). --- -Now the ice is gone, and the depressed land is rebounding. Mapping of (once horizontal) lake shores in the area near the Finger Lakes indicates a tilted rise of almost 250 feet, and it is still rising! To the north, the rise is even greater such that north shore of Lake Ontario is rising faster than the south. Canadian with shore front property are extending their land, and Americans are losing theirs. The same is true with the Finger Lakes. The northern ends are generally swampy and shallow as the lake bottoms slowly rise more on the north end and tilt their waters to the south. --- -My, how the landscape has been changed by sculpting of ice. 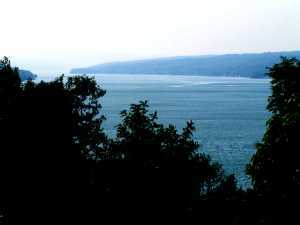 The Great Lakes occupy the valley of the Ontarian River; the Finger Lakes fill those deeply-scoured north-south river valleys, and everything is plastered with the erosional debris carried by the ice sheets. --- -Advancing ice molded the more clay-rich detritus into spoon-shaped hills, drumlins. These hills are steep to the north toward the direction of ice flow. There are thousands of drumlins surrounding the Erie Canal and the Finger Lakes region -- nine hundred in the region of Palmyra alone. Hill Cumorah, scene of a Mormon pageant every summer, is a well-known drumlin. --- -At the terminal ends of the ice sheet, piles of continental scrapings are dumped into high ridges or mounds, called a terminal moraine. In New York we call that glacial garbage Long Island. But, glacial debris litters all the state, since all the detritus within the glacier was haphazardly dropped over the landscape. --- -In 1999, a boggy area was being dug to make a pond. The backhoe operator pulled a large bone from his diggings and told the property owners. They contacted the geology department of Cornell University, and Professor John Chiment, with a hardy crew of volunteers, excavated the site. 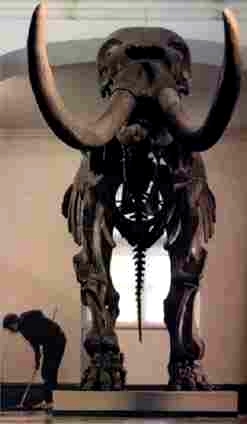 The result is the Gilbert Mastodon, who once strolled through that swampy glacial valley. --- --A There is a legend, passed down through generations of Seneca natives, about a boy who found a beautiful snake in a swamp. He took him home and fed him frogs. Soon, it grew into a huge size and demanded squirrels, then woodchucks, and finally deer for snacks. --- --A The villagers were soon threatened by the monster, so they built a fort atop the summit of Genundowa, 865 feet above Canandaigua Lake to protect themselves from Osaista Wanna, the snake. Before they had compoleted the fort, the snake found them and wrapped his body around the unfinished structure, trapping the people inside. Some villagers tried to escape, but were swallowed by the snake. --- --A A village boy and his sister were told by a god, in a dream, how they might save the villagers. The boy was to string a bow made with his sister's hair. He was to make one shot into the third scale in the monster's throat. He did, and his arrow pierced Osaista Wanna's heart. It took hours for the serpent to die, and in his death throes trees and boulders were ripped from the mountain. As Osaista Wanna's body plunged into Canandaigua Lake, the heads of his Seneca victims (which had turned to stone in his stomach) were regurgitated onto the hills surrounding the lake. --- -- To this day, the Seneca hold important council fires on what is called now, Bare Hill. And, scattered about the hill, are round boulders, called by locals, Indian heads. --- --A And, a denouement for you wine drinkers. Due to its great depth, Seneca Lake has only frozen from end to end four times in recorded history - 1855, 1875, 1885, and 1912. With global warming, it is doubtful that it will freeze over again in our lifetime. The relatively warm open water creates a moderated microclimate with a long growing season that is ideal for vineyards. 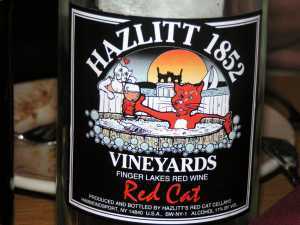 Hence, Red Cat.